This simple sentence says and does so much. Of course helping someone get a task done is great, it helps them organize exactly what they need in specifics, and helps them let go of thinking they can do it all, which is a control issue. When this question is asked of a parent, it doesn’t necessarily mean childcare. Many parents I work with automatically assume their biggest issue to need help is babysitting their child. I have asked this of parents, and suggested picking up specific groceries or paper goods, bare necessities for the home, going out to get the mail, finishing the laundry etc. All the supports that make a home run smoothly are ways to help. Maybe you already make these offers. Be aware of how you physically feel when you say this. Taking a deep breath and look at the person with prolonged eye contact. This lets the other person know you mean what you say and you say what you mean. A great idea is asking your child, at their eye level, “I see you are having a hard time, is there anything I can do to help you?” Watch their reaction. What do you see? How do you feel when you say this to your child? You will be kindly surprised that your child will return this sentence to you when you need it most. I remember I was teaching preschool at a head start. There was a “challenging” child, who would hurt his friends and act out outrageously, dump yogurt on another child’s head, rip books, push the lunch cart into children etc. Oh I had such a special love for this child’s jacket as I saw him walking out the door at the end of the day;) One day he pulled the computer monitor on to the floor. The other children all looked at me, and three were brave and came to me and asked, “what can I do to help you?” I am grateful for the boy who broke the monitor, just to have the three children show me that what I do as a teacher is helping create better people in this world. I am eager to share some ways of chilling-out that you can incorporate in your life. Your child, regardless of their special need is constantly learning from what you do, so show them how to chill out! Shoulder bounces – sit up tall in your seat, relax your shoulders so they are even. Lift your shoulders slowly up to your ears and let them drop back down. Gradually pick up the speed of our bounces, until you have a comfortable rhythm. The benefits loosen up the chronically tight shoulder/neck area, teaches your child that movement doesn’t have to be structured or complicated to have an effect on your state of mind. Count Your Breath This is a great stress re-leaver when your running late. When running late, which I am all too familiar with, is the perfect time to let your self-importance to run out of control as well as beating yourself up. Neither contribute to health. Breathing in for 4 seconds and out for 8 will help to keep you grounded and avoid paying attention to the minutes as they go by on your watch or the dashboard. This will re-direct your mind. The benefits of this exercise will get new oxygen into your lungs, recharge your brain with more oxygen and lower your blood pressure, which is probably sky high at that point. Swim In Your Own Sea of Tranquility Locate the indentation between your breasts, about three fingers from the bottom of your breastbone. Bring attention to that area with slight pressure. If your in public, pretend its an itch. Aim to take twenty breaths while pressing. Release gradually. The benefits open the chest and invites your breath to deepen which triggers the bodies relaxation response, helps regulate your heart beat, and calms the mind. Seated Spinal Twist Keep both feet on the floor, take a deep breath, sit up tall and twist your torso, each exhale try to twist more. I like this exercise while waiting in an airplane. You can place your child on your lap, or physically help them twist. The benefits of this are wringing tension of the muscles that support your spine, helping to prevent back pain. It stimulates the abdominal organs responsible for digestion and detoxification so you don’t get an upset stomach that will usually accompany stress. Mini Loving Kindness Meditation So you’ve never meditated before? Here is a great way to begin…. A screaming baby/child — screaming back only makes it worse. Come up with a short sentence, or you can use; May the baby be happy, may the baby be free from suffering. Say this in a quiet and relaxed voice. Find a rhythm you are comfortable with. Use this with anyone, your Mother, your boss etc. Say it out loud or in your head. The benefits allow you to feel compassion, instead of hating the moment (or the baby) send him/her some love, you will also feel connected to the child/baby, and not just sit and suffer. Elephant Swing is a way to beat feeling lethargic. It’s fun and your children will enjoy the body movement. While standing about 2 feet apart swing your arms and twist your body, the key is to let your arms be loose as possible. Only your toes should point forward, otherwise let it all hang loose, and swing slow in a twist. Elephants do this when they are nervous. The benefits are tremendous and loosens things up so the energy in your body can travel more freely around your nervous system. Focus Pocus will calm your mind and relax your monkey mind;) Press between the eyes firmly. This is an amazing technique to show your child how to do. Depending on the age of your child, he/she can do this while taking a test in school. Closing your eyes and deep breathing will add to the experience. The benefits calm the mind, reduce anxiety and confusion and promote clearer, calmer thinking. This is also used in acupressure to relieve headaches, insomnia and sinus congestion. Legs Up The Wall Lay with your bum against a wall, and your legs up the wall, your body is at a 90 degree angle. This will relieve stress and that “heavy leg” feeling. Breathe and relax here for up to ten minutes. The benefits are relaxing and energizing, your legs being higher than your heart creates a relief for your circulatory system and all the hard work it does. Usually the circulatory system has to work hard to get blood from your heart to your feet, and now you will be helping this system run better! Your body will be thanking you. This is also reversing the effects of gravity, which is what causes wrinkles and varicose veins. So start a practice of incorporating these steps. Draw a beautiful sign of reminders to put in your car or in your house. It’s not easy to start a new regimen, but if you remember how your body will thank you, and what an amazing role model you will be for your child, chilling-out will be common sense. Aloha and thanks for reading! As I come to a close on this fantastic month here in Hawaii, I woke up today thinking about some very specific differences with the children here and the children back home. I have found there to be pretty limited city and state resources for families, no money for providers, not alot of SEIT services, schools for Autism closing mid year….In comparison to NY it is a serious shame. What I do find were many parent/caregiver support groups that have mailing lists of up to 240 families. These groups were easy to find and each group leader I spoke with said they have about 40-50 family members showing up consistently. What I also notice at the beaches, in the malls, on the bus, and everywhere in between are no crying children being dragged down the street or being screamed at in public. Yes, there were children having tempter tantrums, BUT the parents were NOT having tantrums. I know this might sound funny, but we all, myself included, have temper tantrums. No I don’t throw myself on the floor, everyones tantrums “look” different and I’ve learned to incorporate tools to “fix” what is frustrating me. I can honestly say that in NYC I see a crying or hysterical child being yelled and pulled down the street by their parent almost every day. NYC is definitely a more stressed place, it’s huge, it can be a project to get around, it’s cold, and everyone is always moving fast, I am trying hard to not make this a “I dislike NYC” thing, I am not saying everyone pick up and move. I know many parents that work hard “teaching” their children, they are using workbooks, reading to their children, buying educational toys etc. What parents should also remember as a number one fact is – Children learn more by watching – This means ALL children typical and special needs children feel what a parent does more then do what they say. The energy a parent creates in a home is the most important factor in creating a non-stressed environment. Tone of voice, to not only the child, but to other adults and family members, people spoken to on the phone etc. The speed at which laundry is done, the pace which dinner is prepared, the eye contact given when speaking with and giving directions to a child, the family meal. All these activities that go on on a daily basis in the home send messages. Often they are messages of stress. What I am suggesting is a lifestyle change, it’s not an easy one, but there are easy ideas that you can start doing right now, in your home. They will benefit your child and surely benefit you! Choose one, add one on every week, hang up signs to remind yourself, do whatever fits your style to incorpeate stress relievers, your life and your child’s life depends on it. Ignore your call waiting, let people leave messages. Breath through your nose count to four sec., release through your nose for 5 sec. Introduce a journal into your life, include three things for the day, one person you will forgive that day, one thing you forgive yourself for, and anything wonderful that happened. Rub your hands together, make them warm and cover your eyes gently. 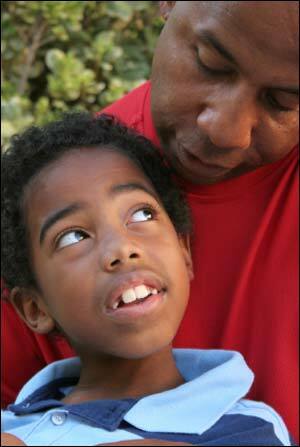 Share mistakes and your true feelings about your day with your child.